Any other factors indicating the defendant’s ties to the community or bearing on the risk of willful failure to appear. Surety bond fees are regulated by law at 10% for in state residents and 15% for out of state residents. Most bonding companies will require a co-signer for the bond. The bonding company fee is not refundable. The Mississippi Constitution authorizes bond to be set by a Conservator of the Peace, either a judge or designated law enforcement officer. In addition to setting the dollar amount of the bond, other conditions can be imposed, for example, no contact with the victim or potential victims, known criminals or co-defendants. The Court can also order surrendering of passports, surrendering firearms, alcohol and drug testing and rehabilitation, and electronic monitoring as a condition of bond. The purpose of bond is to assure the person’s attendance at court, not to punish. To assure court attendance, the bonding company may require the defendant to check in by telephone or in person. In some circumstances a person may be released on electronic monitoring or pretrial house arrest, for example, so treatment can be received for alcohol or drug abuse. House arrest can be monitored by a traditional phone line or GPS which signals the defendant’s location. Other types of bonds include cash bond, clerk’s bond, unsecured bond, property bond and release on the defendant’s own personal recognizance all of which provide the defendant pretrial release. If the bond is too high, the defendant can request a bond reduction. This can be done at the initial appearance, preliminary hearing or any time before trial. In the proper case, the defendant can file for a Writ of Habeas Corpus alleging he is being held illegally because the bond is too high. Gulfport defense lawyer Rufus Alldredge has represented individuals on bond issues, pretrial release, and bond revocations. If a person is released on felony bond and later arrested for a new felony which carries over five (5) years, the law provides that the court shall revoke all bonds and hold the defendant without bond. Pretrial release in the Federal Court is governed by the Bail Reform Act of 1984 and involves similar considerations. If the defendant fails to appear in court, the judge may issue a Judgment Nisi which serves as 1.) an arrest warrant for the defendant, 2.) an order revoking bond and 3) a Scaire Facias on the bond ordering the bonding company to pay the full amount of the bond. This gives the bonding company the authority and incentive to locate the defendant and return him to jail. Keep in touch with your bonding company as directed because the first notice of court setting comes from the bonding company, not your attorney. After arraignment, your attorney is responsible for notifying you of your court setting but your bond is still in effect and you stand to lose your freedom if you do not appear for court. If you have a loved one awaiting a bond hearing, call immediately. Gulfport defense lawyer Rufus Alldredge will get the bond reduced to the minimum allowed and make it affordable. If your bond has been revoked, we will try to get it reinstated. Call the law office of Rufus Alldredge today at 228.863.0123. 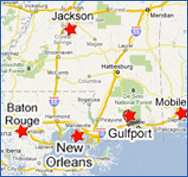 We are located at 1921 22nd Avenue in Gulfport, Mississippi.